In Dutch oven or large saucepan, cook noodles as directed on package, adding broccoli during last 3 to 5 minutes of cooking time. Cook until noodles and broccoli are tender. Drain. Return to saucepan; cover to keep warm. Meanwhile, melt margarine in 12-inch nonstick skillet over medium-high heat. Add pork; cook 3 to 5 minutes or until browned, stirring constantly. Add mushrooms and garlic; cook and stir 2 to 4 minutes or until mushrooms are tender. Add gravy and Worcestershire sauce to pork mixture; mix well. Cook and stir over medium-high heat until mixture is bubbly and thickened. 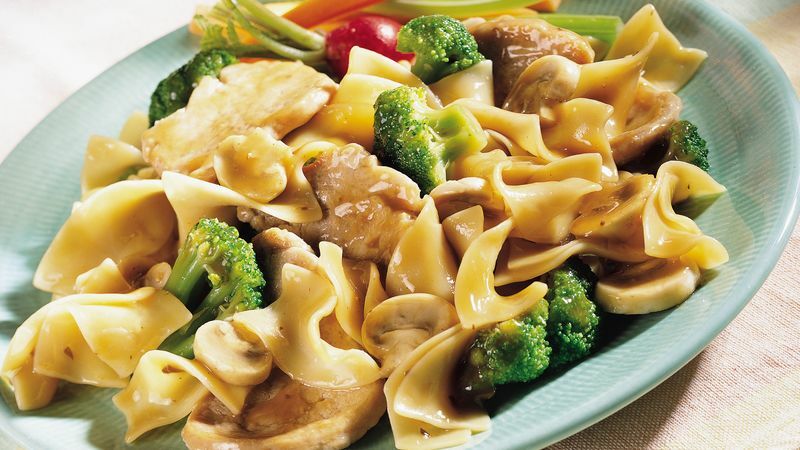 Add pork mixture to cooked noodles and broccoli; toss gently to coat.